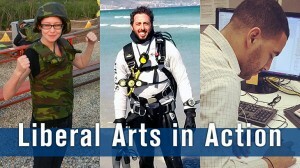 The College of Liberal Arts & Sciences at SUNY New Paltz proudly announces the debut of “LIBERAL ARTS IN ACTION,” a new collection of stories told by alumni who are putting their liberal arts educations to work in a wide variety of rewarding careers. These stories will be featured on a new website celebrating liberal arts graduates working in business, politics, education, non-profits, sports, and a number of other fields, in the United States and international locations like China, Japan and Guatemala. This collection of outcome narratives is the result of a wide-ranging project, in which the College of Liberal Arts & Sciences asked alumni from its 17 departments and programs to reflect on how their educations contributed to their current professional and personal successes. “Liberal Arts in Action” launches as a catalog of 41 responses (and counting), all speaking to the diverse and marketable skillsets New Paltz alumni have developed through the engaged study of liberal arts. Alumni interested in adding their perspective to this growing resource for current and prospective students can submit a profile via the “Share Your Story” link at the top of the page. More information about the College of Liberal Arts & Sciences is available online.